Discussion in 'New Member Introductions' started by fletch, Mar 24, 2019. I'm new to goats (one month in), but already in love with the critters. Have 2 males Boer/dairy mix. One nibbled on a nandina plant a little bit (few sprigs) this am and I have mayapple coming up in a few places. They found a loose place in the fence which I have now fixed, but I was wondering if they would eat the mayapple (if so, how poisonous is it) and what if any signs, should I watch for after nandina . Glad to have so many new friends in the forum. I live in East Tennessee. 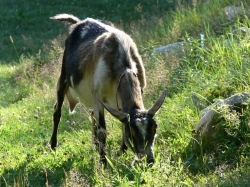 The goats, Frank and Jesse, have an acre of land to play on, lots of people friends, and are already spoiled. The electric fence is back up and running after Jesse's escapade. AmberLops, B&B Happy goats and CntryBoy777 like this. B&B Happy goats likes this.